Exploring Countries and Cultures (ECC) was our first year in the family cycle of My Father's World. It was by far one of our favorites! I also think it is essential to begin with this study; the geographical and cultural context you gain will be essential to any historical study that follows. The beauty of this curriculum is the core teaching is done together, with additional activities are suggested for older students. While the Daily lesson plans are in an easy-to-use weekly chart format, it took a few weeks to get the hang of the family cycle. Since the curriculum designed for a multi age classroom, some resources hit younger kids, some middle elementary, and some for older. Don't get discouraged if a resources seems over your kids heads. You'll see below we had some books that we didn't use now for my 3rd graders, but will use when we repeat the cycle in 8th grade. Don't get overwhelmed if you are beginning, the manual will become easier to navigate as you establish the rhythm for your Together Time. It took a week or so of actually teaching from the manual to be comfortable with the flow, and to learn how to leave items out that weren't meant for us. Throughout the year, you will also need to assess if a book suggested works for ALL your kids. It is OK if your youngers don't retain all the details from every book, they are still learning at their own level. For those of you like to check all the boxes,you need be OK with sometimes not doing something listed because it is too old or too young for your kids. Below are descriptions of why a book did , or did not, work for our kids. Your kids are different, so your cons may be our pros! Please leave a comment on what works for you! Hero Tales- We really enjoyed this kid friendly book of true stories of godly men and women and the character traits they portrayed as they served as missionaries. The manual lays out the schedule well, so you learn about a missionary from the continent you are studying. We printed copy work from Mama Jenn that helped cement then stories and lessons, and counted as handwriting practice. Window on the World- This was an informative book, that was also a family friendly introduction to the religions around the world. I like that it gave us specific prayers for each country, to teach us how to pray for different cultures. It also gives you context on a bigger variety of countries that the student sheets. God Speaks Numangagg- This book is only used once, but it s a great read. Memory Verses & Bible Copy work- We did not do the Weekly memory verses and daily readings from Matthew because my kids are active in AWANA, a Bible Memorization Club. They had enough copy work with Hero Tales printables (see above). Missionary Chapter Books (Deluxe package)- These were way too old for my 3rd graders. We may visit them again when they are older, but Hero Tales covered all the heroes already, so it felt redundant. Teacher's Manual Hands-on activities (cooking, flag sticker book, passport, etc) were easy to execute, without buying too many crazy extra items. I would usually make whatever food item was called for on Friday. If we didn't want to use the recipe in the manual for the country, I'd just google a simpler recipe for that country. Student Sheets- You will definitely need the student sheets for this year!! 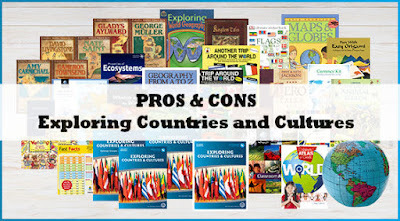 Trip Around the World & Another Trip Around the World- These books have a few extra worksheets & activities for some of the countries you visit. You will have to make copies for each child. Book basket- We used the book basket list and the library heavily this year, more than any other year. These books will so much more context than you can provide to your together time. Remember this is a jumping off point for your library search! Every country allowed us to fill the library basket full of fiction and non fiction books for all ages. Online library searches at home were a weekly event, and allowed me to easily add many books that weren't on the book list to our basket. Studying one country or continent at a time made finding alternatives very easy. Geography resource books of Children's Atlas of God's World, Classroom Atlas, & Maps and Globes were everyday resources that were essential to the study. We did enjoy the blow up Globe, and used it a lot each day. Geography From A to Z was a wonderful book, age appropriate book. It might have been our favorite book of the year! The illustrations are clear and even taught me many new vocabulary words. The books is also scheduled strategically throughout the year, like learning about Fjords when you visit Norway. We used the Printables from Mama Jenn, so that at the end of each child had their own hand drawn dictionary! Currency Kit- We used the money kit, but never fully the way described in the manual. We were suppose to use it to "buy" items in your house each week. What we did was to have them visit the "Money exchange" office each time we got a stamp in the passport. Each new country, they would exchange $10 American for the currency of that country. They just kept the money with their passport, until we went to the next country. Wall World Map-We did not use a world wall map due to a very small house & not enough wall space, instead used the map placement we had bought during Adventures in U.S. History. The blow up Globe also took the place of the need for the wall map. If you have the room for this in your house, go ahead and put it up!!! Geography Game. Even though it comes with the Student Sheets, we never actually used the Geography Game. Instead we used Stack the Countries App . Exploring World Geography. We did not use this, as I only had two 3rd graders. I am sure we will use it for when we do the cycle again, but it is more for upper elementary or Junior High. Research skills are developed through the study of continents, many reports are done that are better for older kids. Our favorite part of this year was the easily accessible science topics. All kids love animals, and the focus on different habitats (desert, rain forest, grassland, forest, polar region, etc.) was loved by all. Living World Encyclopedia was a great kid friendly book, with lots of bright illustrations. Book Basket-Plan to get many of the optional library books listed in book basket, especially for younger kids. If the book listed isn't at your library, just type in Keyword for whatever ecosystem you're studying! The ecosystem always correlates to the country being studied (e.g., rain forest when studying Brazil), so searching your library catalog will be pretty easy. Even the least well stocked libraries should have some fiction and non-fiction books on the major ecosystems (babies animals in the desert, animals of the savannah, etc.). The Great Animal Search- This is a good book for younger kids. Again, the animal study was very age appropriate for elementary aged children. Properties of Ecosystems was a good book that we tried to read with my science lovers. It is more of a textbook, as opposed to a living book. While we enjoyed it sometimes, it mostly just went over the head of my 3rd graders and they didn't retain any details. I'd recommend it for older elementary/junior high science lovers, but may be a bit much for most elementary aged kids. We will probably like it much better when we repeat the cycle later in 8th grade. Weekly nature walk and nature journal. I know this is so important to Charlotte Mason, but we just spend a lot of time outside already, there was no need to formalize the walks. We have never kept this up. The Complete Books of Animals (for 2nd & 3rd graders). We did not use this book, because we used Draw Write Now which was a science and art curriculum combined. I found our schedule for these books on the MFW ECC Group. We also felt the abundance of library book options made this book redundant. If you do not use Draw, Writw, Now or your library is not well stocked, I would recommend getting this book for 2nd & 3rd graders. For 7th and 8th graders, add Apologia science (purchase separately). We were in 3rd grade, so this didn't apply to us. Teacher's Manuals Art Projects- I am an artistic person, but can slack on art with my kids. Thankfully the projects were scheduled that didn't overwhelm the day, or require super weird materials. Example: When learning about Mexico, we made tissue paper flowers on Thursday that we then used for our fiesta on Friday (we made homemade tortillas on Friday, and it was almost the only thing scheduled for the day). Fun with Easy Origami (Deluxe package)- My kids LOVED this book. That said, is only used during Japan, so you could easily get a simple Origami How-To Book from the library! Be prepared from a house full of paper animals! GLOBAL ART (Deluxe package) The teacher's manual provides so many hands on activities, that I didn't usually feel like we needed any projects from this book. It would make your day extraordinarily long if you added all these. If you have crafty kids, you will like to be able to pull from this book throughout your year. Wee Sing around the world (Deluxe package) At first, when we finished every country by eating food from that country, we would play a song from that region while eating. But the CD only has one song from each region. I would recommend just getting some CDs from that country from your library, or looking up some on your phone. Language lessons for Today, Grade 3- We again enjoyed LLFT, because it is a gentle Charlotte Mason approach to language arts. Some feel it is too light, but as we have stuck with it, I have seen it gets harder at an age appropriate level. Some years past have felt almost too light, but I think the 4th and 5th grade are beginning to pick up, and challenge them more with grammar and writing. Cursive handwriting - This was a great year to start cursive. We enjoyed Cursive Connections: Modern Style , but I think MFW has a different recommendation now. Spelling- Spelling Power is confusing, and just does not work with our work-boxes. It is very teacher driven and we needed a more independent spelling curriculum that didn't require so much teacher presence. We used Spelling By Sound and Structure for Christian Schools. 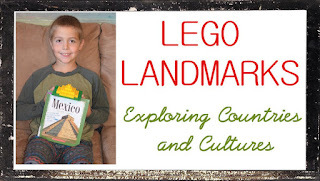 LEGO LANDMARKS, free supplement using the Legos in your house- This past year we turned my boys' Lego obsession into another avenue of learning. Friday Family Movie Night. Family movie night during ECC always included a movie from whatever country we were studying. Thankfully Disney has done several different countries. You can find an extensive list in the MFW ECC Group. Workboxes - The Workbox system has saved my sanity! I can't imagine homeschooling without it! Draw Write Now We used this as a science, art, and handwriting curriculum, and my kids LOVED IT. Their drawing improved by leaps and bounds, and it as an independent activity that worked perfectly with our work boxes We used a schedule for these books in MFW ECC Group. Good to know! We look forward to reading them the next time we do the cycle! This was a super helpful review! Thank you so much for taking the time to write it. I'm currently doing Adventures with a young 2nd & Kindergardner. I'm excited for ECC but wondering if I should hold off a year. Hearing how it worked for you is helping me think through that. We are missing the Ecosystems book and while it sounds fun to me I love that you pointed out its textbook-is style. I might not work so hard to track it down. I'm so glad it was helpful! We skimmed the Ecosystems book with my third graders, but I'm excited to repeat the cycle with them in 8th grade when that resource is much more age appropriate. Good luck with ECC, it is a great year! !